It's not easy - or cheap - to fix giant city clocks. Take the case of AT&T today announcing that it plans to sponsor the landmark clock on Pittsburgh's Duquesne Brewery, which has been through a host of sponsors including Duke Beer, Stroh's, WTAE-TV and most recently, Equitable Gas. The clock's previous sponsor Equitable Gas decided not to renew and the clock has sat stuck for several months. Scott Waitlevertch, spokesman for Equitable Gas, told the Pittsburgh Post-Gazette that the seven-year run was "a worthwhile effort. It was great to have a presence on the city skyline. But we decided to pursue other avenues of branding and a new logo." Meanwhile, a little further north, the City of Ithaca is also looking for a little help with their center city timepiece. City officials are seeking a $20,000 sponsorship to repair the clock and will allow the chosen company to post its logo below the clocks for two years. They've received one offer thus far, but haven't yet accepted. AT&T's deal in Pittsburgh was likely considerably more rich. 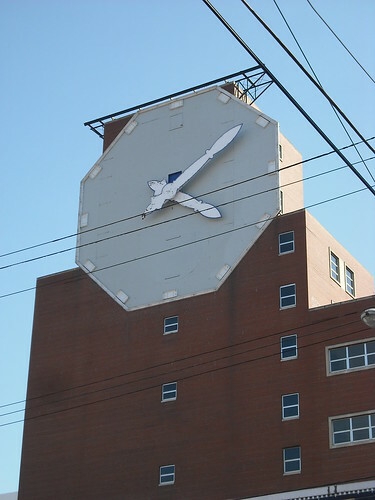 The company didn't provide deal terms, but in 1999 Pittsburgh Breweing Company paid $44,000 to repair the clock and more than $5,000 a month to sponsor it. Some might say the real price for having it fixed will come at the expense of citizens, who now will be faced with seeing an orange and blue clock atop one of Pittsburgh's iconic buildings. What do you think of clock sponsorship? Do these deals supply enough community goodwill to justify their investment?